It’s what MINI calls ‘the world’s first premium miniature SUV coupe’. At the 2011 Detroit auto show, the MINI Paceman cruised in as a two-door version of MINI’s Countryman crossover. Since then, the Paceman concept car has evolved into the production-ready Countryman Coupe. At the 2012 Paris Auto Show, the Paceman showed up with a name change and the confirmation of sales in 2013. Projected to have the drivetrain, 6-speed gearbox and 4-cylinder engine of the current 5-door Countryman, the Countryman Coupe will most likely sport the same 208 horsepower as its predecessor. A peppy John Cooper Works version of the Countryman Coupe will also be available, with a 1.6-liter twin-scroll engine turbocharged with 211 horses. The MINI Countryman Coupe sends all of this power to MINI’s exclusive AL4 all-wheel drive system (an option for front-wheel-drive will be available). As with all MINI cars, the electric speed-sensitive steering module will provide excellent handling and agility. A unique back-end, alternate bumper and redesigned taillights will separate the two-door Countryman Coupe from the previous Paceman concept car design. Differences between the original Countryman and Countryman Coupe are significant. Aside from the 2-door design, the Countryman Coupe is a full inch shorter than the Countryman, creating more of a ‘horizontal’ design. The cockpit of the Countryman Coupe is expected to have front leather sport seats and upscale materials coating the interior. Details on the technology and options available for the cabin have yet to be announced. Expectations are that the backseat should offer the same generous legroom that the original Countryman had to offer. The Countryman Coupe will start worldwide sales in early 2013, with 20,000 models expected to come to the market. The Countryman Coupe will be MINI’s 8th production car, coming off the heels of the MINI Coupe and Roadster. The new MINI Countryman Coupe will be available at MINI of Pittsburgh in 2013. Call us for arrival information, or visit our online inventory for our current selection of new MINI cars. 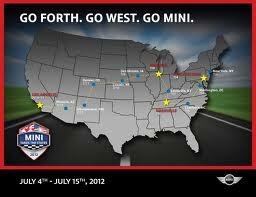 Come motor with MINI and thousands of people across thousands of miles as part of MINI Takes the States 2012. From July 4-15, a procession of MINIs will travel the country, creating one extraordinary road trip that only MINI can deliver. MINI Takes the States 2012 will begin July 4th, heading out from New York. The journey will end in Los Angles on July 15th and will encompass 16 states, 13 cities, and countless towns in between. All MINI owners, their families, friends, fans, and co-pilots are invited to join the rally either from start to finish or at some point along the way. Everyone participating must register online at http://www.tpgevents.com/registration/minitakesthestates2012/registration.cfm. A suite of new high-performance MINIs is coming to town. The John Cooper Works line of MINIs pack a punch of power and fuel efficiency as the newest incarnation of the MINIMALISM attitude. The principle behind MINIMALISM relies on engine efficiency in fuel consumption and emission-reducing technology. The MINI John Cooper Works has both of these, while still offering instant power on the pedal. The 2013 models will carry a next-generation John Cooper Works engine based on the powertrain in the MINI Cooper S. This powerhouse will use a twin-scroll turbocharger, direct injection and VALVETRONIC variable valve control. The VALVETRONIC throttle-free load control boosts the response of the engine, in addition to improving efficiency. The 1.6-liter, 208 hp, four-cylinder engine is paired with a 6-speed manual gearbox, with an optional automatic that features Steptronic function. The electric motor only uses energy when power is needed, which helps to reduce fuel consumption. However, fuel efficiency hasn’t affected the power and fun in the drive. 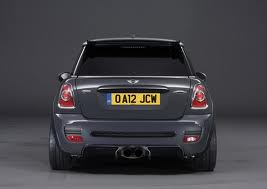 The 2013 MINI John Cooper Works Hardtop can hit 60 from 0 in just 6.2 seconds. The ‘overboost’ function will take the new John Cooper Works engine from 192 lbs-feet of torque up to 207. Model lines include the MINI John Cooper Works Hardtop, MINI John Cooper Works Clubman, MINI John Cooper Works Convertible, MINI John Cooper Works Coupe and MINI John Cooper Works Roadster. The MINI John Cooper Works Countryman will come with ALL4 all-wheel-drive. MINI has recently partnered up with Miles Ahead to become The Official Car of the Miles Ahead Teen Driving Intensive. The Miles Ahead program works with teenage drivers in efforts to decrease the number of auto collisions and injuries caused by this age group. The program puts students behind the wheel in controlled environments where teens can learn behaviors and techniques in order to become more confident drivers. During the Miles Ahead program, teenagers learn and practice car control, handling and avoidance exercises. Although learning about vehicle safety is not at the top of every teenager’s to-do list, Miles Ahead makes it fun, taking advantage of their affiliation Indianapolis Motor Speedway and IndyCars. Miles Ahead proudly selected MINI vehicles as their exclusive school vehicle. They chose MINI as their reputation for quality, efficient, safe and well-maneuvered vehicles is perfect for the program. Miles Ahead also teaches teens about the great MINI safety features such as the standard anti-lock braking system, dynamic stability control, three-point safety harness and six airbags MINI vehicles have to offer. Mini of Pittsburg proudly supports MINI’s collaboration with the Miles Ahead Teen Driving Intensive. It is very important to teach new drivers the importance of safety and handling on the road. If you are interested in finding out more about this great program, feel free to swing by our Pittsburg, PA dealership. Our associates will be happy to answer any questions you may have.